It boils down to confession. Because when the confession lines grow short, sin prevails; first forgotten and then celebrated. Confession keeps us grounded in the truth, as we confront sin and root it out. Without it, we become blind to sin and begin to think and do stupid things. We knew that about Ireland, and yet, we held out hope. 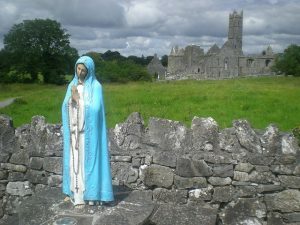 Not Ireland, we thought and prayed: Please not Ireland! We knew the Irish had largely abandoned the Church and yes, in a way that the devil kills two birds with one stone, the Church had abandoned them in some ways. Decades of covering up clergy sexual abuse had left two victims: the physical victims and the Church. For it was not the teachings that were at fault, but rather the lack of its practice. Actually, make that three victims; the third being onlookers that grew in cynicism and hatred for what they perceived as the Catholic Church. Cynics have a way of influencing and spreading negativity among those not moored in the truth, and so it was with Ireland. Still, we had hoped that Catholicism was still in the Irish DNA so that on May 25, they would have preserved unborn babies’ right to exist. Now, we are haunted by the hellish dances with squeals that channel the devil’s glee that death has come to the Emerald Isle. I am Irish. My Dad’s parents immigrated from Ireland. I was named for St. Patrick and I use my maiden name Maguire in writing as a connection to both family and Ireland. In early grade school, I went to St. Albert the Great in Dearborn, Michigan which was served by a convent of Irish nuns. A contingent of over thirty Marist Sisters came from Ireland and England to serve the Detroit archdiocese beginning in 1956. Irish is the only nationality that my husband and I share, making it the biggest part of our children’s heritage. Being Irish has always meant something wonderful to me and now, it means something calamitous. It means that untold babies of my nationality will die before they are born and the catyclismic post-abortive suffering will spread to the Irish. Last February, I wrote about the rise in demonic activityin Ireland according to an exorcist there. Father Patrick Collins reported that as the Catholic influence has diminished, people have lost their spiritual protection and he has been seeing more demonic activity. He was imploring his bishop to train more exorcists. The problem in Ireland is the same problem throughout Europe, according to Msgr. John Esseff, a priest in the diocese of Scranton, Pennsylvania, for 65 years and an exorcist for over 40 years: few people frequenting the sacrament of confession. When confession lines grow short, demonic activity increases, he explained. “Since Vatican II with the decline in the Sacrament of Reconciliation, we’ve seen not just an increase in abortion but also in personal sin which is the primary work of the devil,” Msgr. Esseff said. “This has been true all over the world where the Church has declined. How ignorant it is to dance in the streets and celebrate sin because people’s consciences have atrophied. How sad that so much of Ireland have suffered that fate. Let us keep praying for them. The World Meeting of Families and papal visit are scheduled for August in Dublin. May it begin to send the pendelum back in the other direction, towards the truth and grace of God.